Jim Clark won his first grand prix at the hazardous Spa circuit that sweeps through the Ardennes pine forest, making it three wins out of three for British cars this season, and the first for the new monocoque Lotus 25. As in the previous two races, it was an all British front row with Graham Hill on pole in his BRM. Clark started back in 12th after suffering with engine problems in practice, but instantly made up ground when the race started. He was soon on the tail of the leading group headed by Hill, Bruce McLaren and Lotus team-mate Trevor Taylor. By the end of the opening lap he was comfortably in fourth and, breaking lap records as he went, swept into the lead on the 10th lap. Taylor and Willy Mairesse, an occasional Ferrari driver, were battling it out for second, tussling wheel to wheel for the majority of the first 26 laps. But then Taylor's gears locked and the car skidded off the track, slamming into a telegraph pole and cutting it clean in two. The front of the Ferrari clipped the back of the Lotus, crashed and burst into flames. 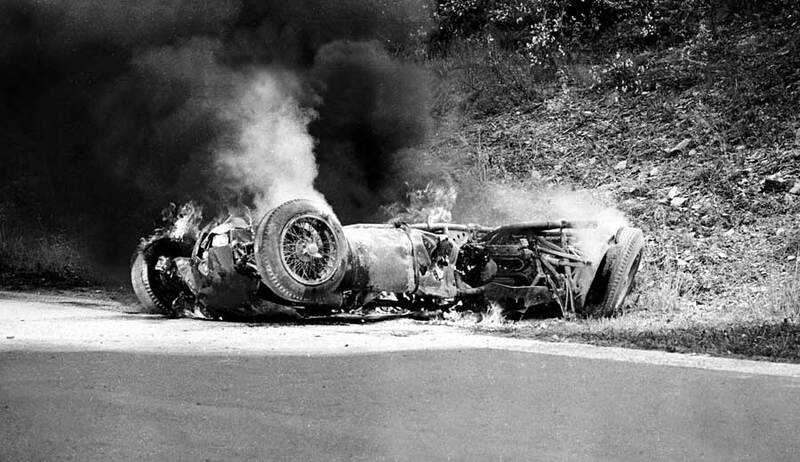 Taylor leapt from the wreck of his Lotus and ran across to help spectators pull Mairesse out of his blazing car, saying afterwards; "Suddenly my car careered off the road, hitting a lamp-post. I only got a scratch. Mairesse's car went up in flames. I ran over and helped spectators to pull him out." Mairesse was taken to hospital with burns and slight facial injuries, which were enough to put him out of racing for three months. Remarkably, Taylor only had a grazed wrist. Away from the drama Clark went on to win comfortably from Graham Hill, with the two Ferraris of Phil Hill and promising young Mexican Ricardo Rodriguez in third and fourth. Rodriguez became the youngest driver to score world championship points, a record he held for 38 years until Jenson Button broke it at the 2000 Brazilian Grand Prix. Graham Hill led the world championship with 16 points, two ahead of Phil Hill, with Clark and McLaren tied for third on nine points.